The model's lifting capacity will allow you to work with trucks. 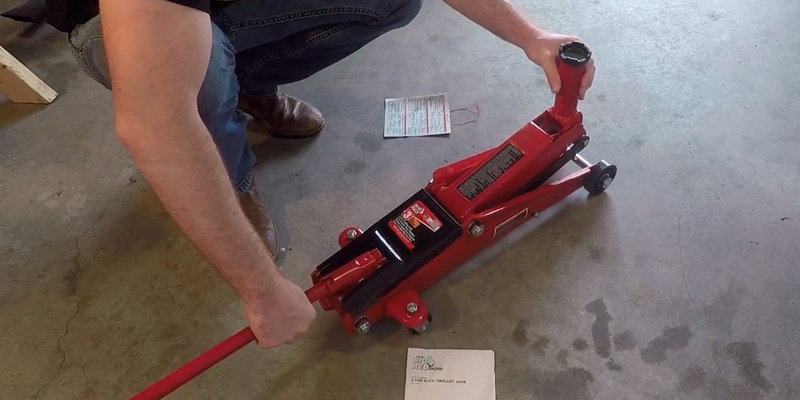 The unique design of this car maintenance device will let you quickly lift to the jacking point with no load. The bypass device prevents the kind of damage that can occur from overpumping. The large size of the jack impedes transportation and usability. The BLACKHAWK B6350 is a professional tool that will allow you to handle just about any vehicle. 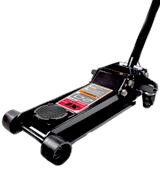 A solid number of safety and convenience features, as well as the ridiculous lifting capacity, make this model one of the best floor jacks that money can buy. 28.5" x 13.5" x 6.6"
The dual pump allows for quick lifting up to the needed height. The safety valve will prevent overloading. The universal joint release mechanism provides precise control over lowering. Some customers remark that the box in which in the jack comes in is flimsy and unreliable. Thanks to excellent characteristics, this hydraulic car jack will be perfect for use in a garage or workshop for maintenance of various equipment. 26" x 6.3" x 12.2"
The jack incorporates a particularly wide stance that provides a certain amount of stability under a large load. There's a built-in safety overload system that will prevent any use beyond the rated capacity. Equipped with a two-piece handle, this product is really easy to transport and store. The instruction manual is uninformative. It is the model's lift range and construction that make the Torin T83002 such a versatile and well-balanced product. 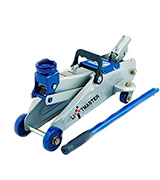 Though it is one of the better floor jacks for inexperienced users, it will be able to satisfy even the most seasoned mechanics. 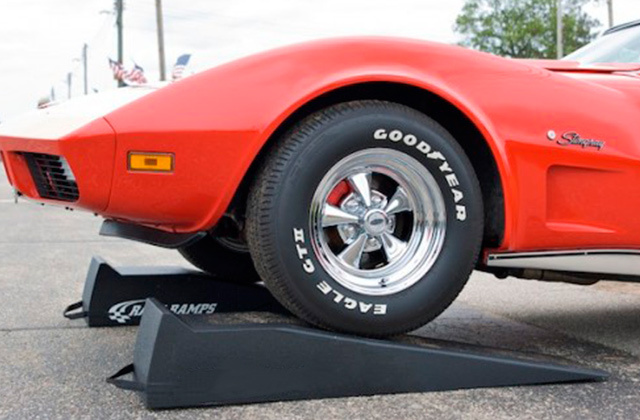 Boasting a minimum lift height of 2.875 inches, the tool's low profile will allow you to reach even under show cars. It features a particularly tough and precision-welded construction with an industrial-grade finish. The company's very own Rapid Pump®, a dual parallel pump system, will allow you to lift an average car in less than 4 pumps. You'll have to change the hydraulic fluid quite often. 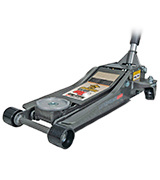 This low profile floor jack from Pittsburgh Automotive is one of the most rugged and tough jacks you could find. 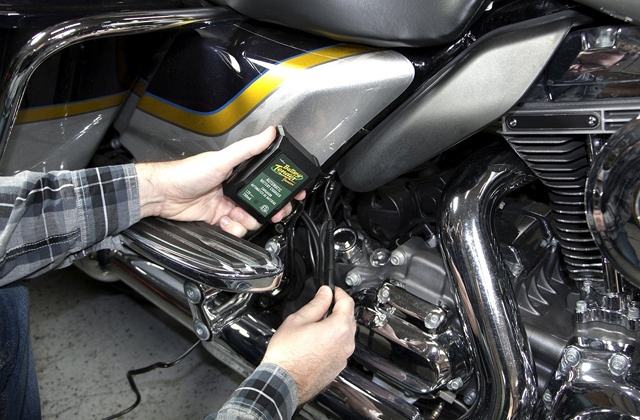 And while it does not necessarily trail behind in terms of versatility, we would recommend this instrument to professional mechanics first and foremost. With 20.9 pounds in weight, this is one of the more portable floor jacks. The heavy-gauge steel frame makes the whole thing robust and durable. A rust-resistant finish will allow this tool to serve you for years to come. A 360-degree swivel saddle makes for a solid load contact, and that's about as much help as you need to get by. The lift range is quite low. LiftMaster 615 will prove to be a great first choice for people who are looking to take care of their own car. It is as good of a car maintenance tool as any to learn the ropes and figure out how to repair your vehicle on your own, without paying for professional services. 17.7" x 7.9" x 5.5"
Without unnecessary introductions, BLACKHAWK B6350 is easily one of the best floor jacks on the market right now. First, the model features a lifting capacity of up to 7700 lbs (3.5 tons). That kind of strength will allow you to lift a medium-sized truck. It also features a serious lift range. The minimum lift height starts at 5.125" inches and it stretches all the way to 21.5". Of course, the manufacturers haven't been able to avoid the usual downside of that kind of strength and versatility. 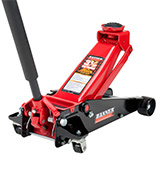 With the size that adds up to 28.5" x 13.5" x 6.6" in overall dimensions and the weight of 85 lbs, this is certainly not the most lightweight and compact jack, but that is a small and a necessary price to pay for its lifting range and capacity. But it isn't just the numbers that make this heavy-duty floor jack better than the majority of similar tools. 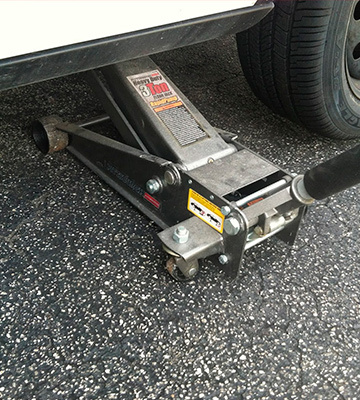 It is also the unique design of this car maintenance device that allows you to quickly lift to the jacking point with no load. The model also comes equipped with a swivel saddle. The latter doesn't just provide you with easy jack positioning but also ensures user safety. Other than that, there's also the bypass device that prevents the kind of damage that can occur from overpumping. Working with automotive supplies and heavy machinery in general, safety should always be your number one concern. Though with the model's built-in internal safety valve and vent plug, you won't have to worry about much as they ensure as safe of an operation as it gets. Again, the BLACKHAWK B6350 is a professional tool that will allow you to handle just about any vehicle. 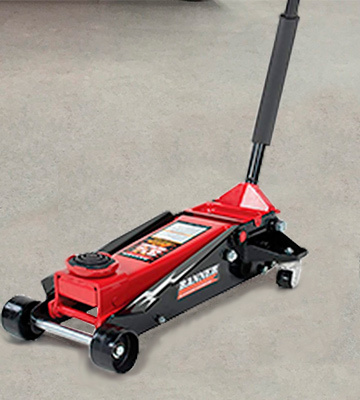 A solid number of safety and convenience features, as well as the ridiculous lifting capacity, make this model one of the best floor jacks that money can buy. The Arcan XL20 refers to rolling car jacks. 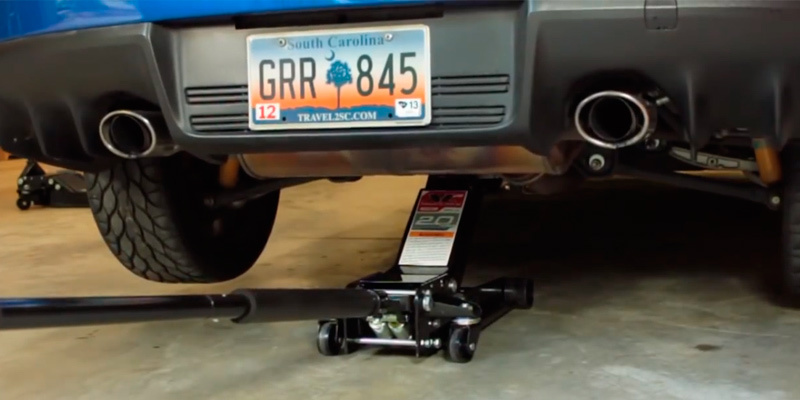 The jack is designed in a way so that you can roll it under your vehicle from any side and quickly lift either one part or the entire car with ease. 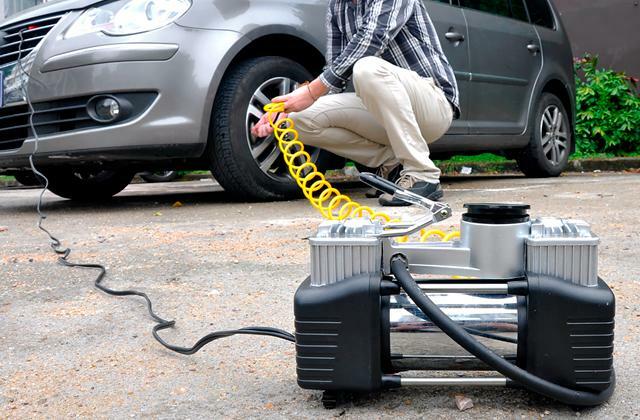 The dual pump gear provides quick and easy lifting of any vehicle which weight does not exceed the lifting capacity. Yet, if you happen to lift a heavier car than that predetermined by the lifting capacity, the lift won't be done because the safety valve will stop it. This way, neither your car nor your car jack is going to be damaged. The dual pump of the Arcan XL20 allows for quick lifting of loads weighing up to 4,400 pounds to the height of 18.1 inches. These parameters are enough for lifting passenger cars and jeeps. 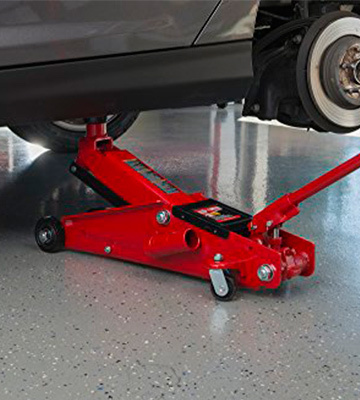 The minimum lift height of this jack allows you to easily roll it under vehicles with clearance of 3.5 inches, so you can easily use it for repairing sports cars. 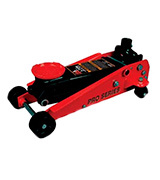 In addition, the manufacturer offers a related model with an extra low lift height of 2.75 inches. 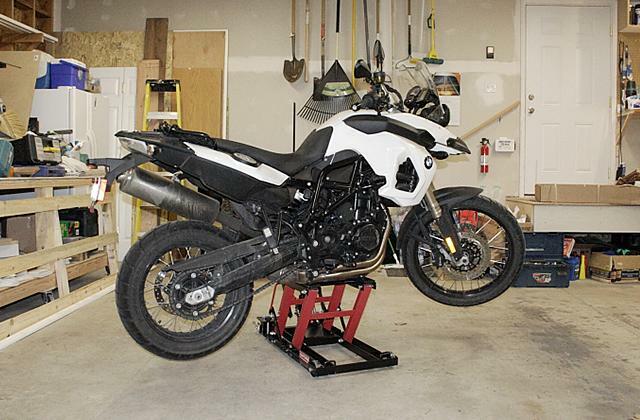 This model is able to lift vehicles up to the height up to 24 inches. If you don't need to lift your car higher than that, make sure to hurry and get the Arcan XL20 car jack today. The design and the size of this hydraulic jack are perfect for use in a garage or in a workshop. The wide base platform (26 х 12.2 inches) provides excellent stability and minimizes the risk of overturning under heavy loads. The jack weighs 68 pounds, making the unit rather steadfast and bulky. However, it's not as to say it's not as mobile as smaller tools. Thanks to the 4 heavy-duty wheels, you'll be able to move it to anywhere you need. The Torin T83002 is one of the more balanced options that we were able to find. 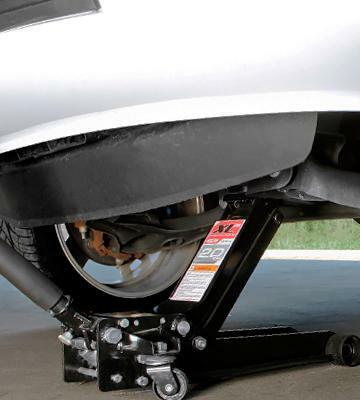 With about 3 tons (6,600 pounds) of lifting capacity and a 5.12-inch to 20.1-inch lifting range, the jack in question will allow you to lift just about any car and even some of the more lightweight trucks. 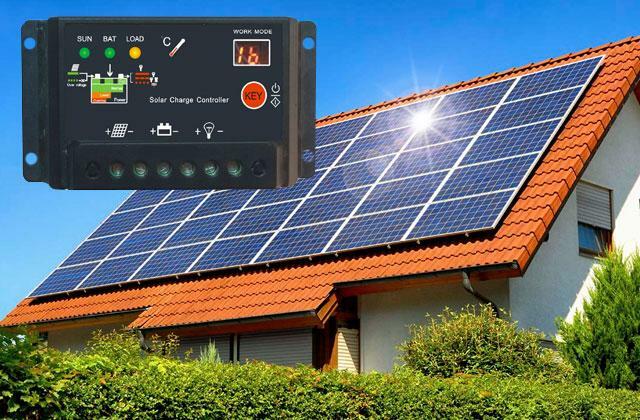 Now, if you do not have a ton of experience with these kinds of things, it may sound like a difficult and dangerous task. But that's not necessarily the case here. For instance, the model incorporates a particularly wide stance. It's not a huge change but this seemingly small modification provides a considerable amount of stability under a large load. And as far as user safety is concerned, this floor jack comes equipped with a built-in safety overload system. 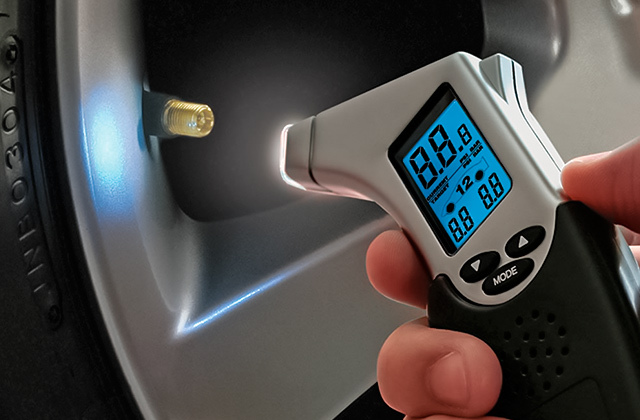 The system will prevent any use beyond the aforementioned capacity, a further argument in favor of this tool being a great option for inexperienced mechanics. What we particularly liked about this model is that it doesn't matter whether you have a small or a large garage. Equipped with a two-piece handle, this product is really easy to transport and store, making it one of the very few truly portable heavy-duty jacks with a high lift. To rephrase our earlier point, it is the model's lift range and construction that make the Torin T83002 such a versatile and well-balanced product. Though it is one of the better floor jacks for inexperienced users, it will be able to satisfy even the most seasoned mechanics. Though this model from Pittsburgh Automotive has quite a lot going for, its biggest selling point is right there in the name of the product. Boasting a clearance (minimum lift height) of 2.875 inches, the tool's low profile will allow you to reach even under show cars. But despite the low profile, the model is as heavy duty as they come, capable of lifting up to 6,600 pounds (3 tons) of weight. Plus, with a considerable maximum lift height of 19.75 inches, it will allow you to get just about any vehicle almost 2 feet off the ground. Though a small company, Pittsburgh Automotive has managed to make quite a name for themselves on this particular market thanks to the industrial quality of their materials. And this floor jack doesn't intend on being an exception, featuring a particularly tough and precision-welded construction with an industrial-grade finish. The company's very own Rapid Pump®, a dual parallel pump system, will allow you to lift an average car in less than 4 pumps. The model's universal joint release is a particularly helpful feature as it provides the most precise load control, regardless of the handle position. Speaking of which, the two-piece knurled steel handle will ensure a secure grip. Plus, it comes equipped with a foam bumper, a nice little touch that will help prevent damage to your car's finish. Finally, the extra-wide steel casters make this device a bit better in the stability department. 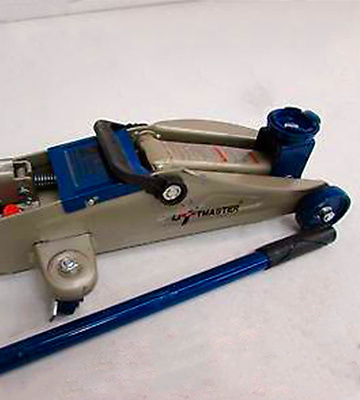 In conclusion, this low profile floor jack from Pittsburgh Automotive is one of the most rugged and tough jacks you could find. And while it does not necessarily trail behind in terms of versatility, we would recommend this instrument to professional mechanics first and foremost. 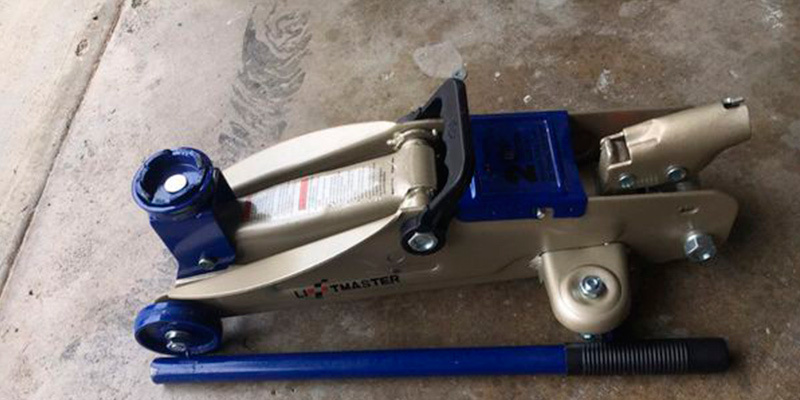 LiftMaster is an ambitious name but if you don't plan on dealing with trucks, this jack will fit you to a tee. Capable of elevating up to 4,400 pounds (2 tons) of weight, the instrument's lifting capacity will prove to be more than enough for most cars. That said, we were not impressed with the model's lift range. While 5 inches of minimum lift weight is pretty standard as far as these things go, the maximum lift weight of 13 inches will limit your options. But there's a considerable upside to it. With 17.7 x 7.9 x 5.5 inches in overall dimensions, this is easily one of the most compact jacks out there. And considering the ultra low weight of 20.9 pounds, the model will provide you with outstanding maneuverability and positioning capabilities. 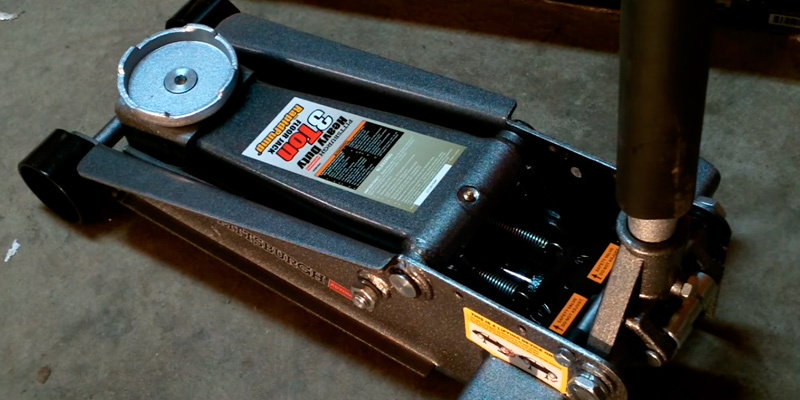 While it may not seem like the toughest device, this floor jack is actually as rugged as they come. The heavy-gauge steel frame makes the whole thing robust and durable. And a rust-resistant finish will allow this tool to serve you for years to come. A jack like that isn't the most difficult tool, to begin with, but the manufacturers have also made sure to add a 360-degree swivel saddle. It makes for a solid load contact, and that's about as much help as you need to get by. In short, the LiftMaster 615 will prove to be a great first choice for people who are looking to take care of their own car. 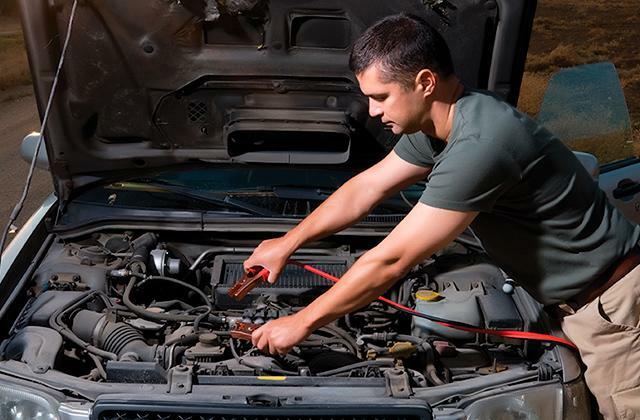 It is as good of a car maintenance tool as any to learn the ropes and figure out how to repair your vehicle on your own, without paying a professional mechanic. 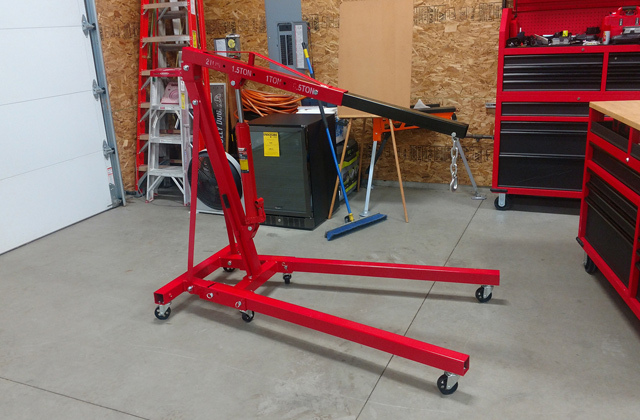 Though there are plenty of different tools out there, a floor jack is easily one of the most essential parts of any workshop. 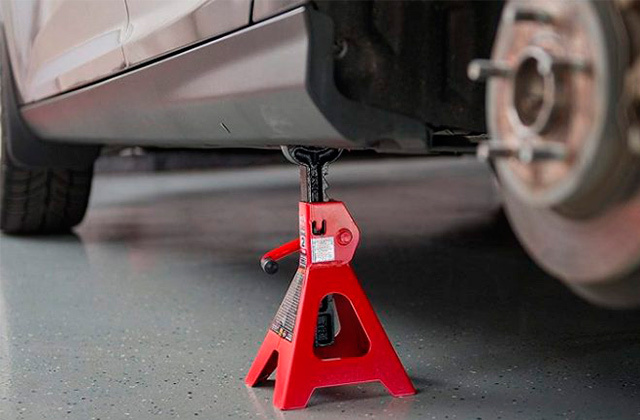 Whether you're a DIY enthusiast, an aspiring professional mechanic, or just a person that appreciates cars and would like to be able to repair them on your own, you cannot afford to skimp on a floor jack. 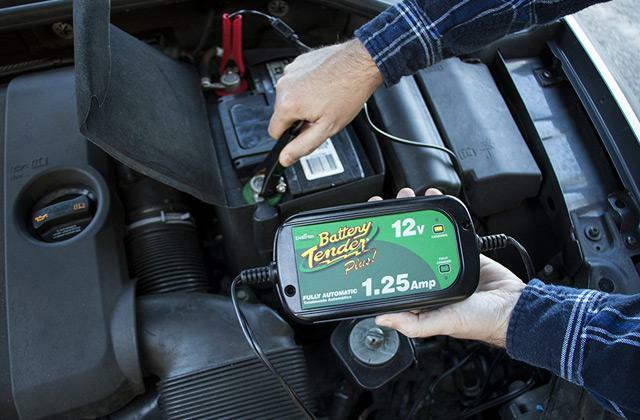 Simply put, a device like that is a car maintenance tool that you can use to lift a part of the vehicle. 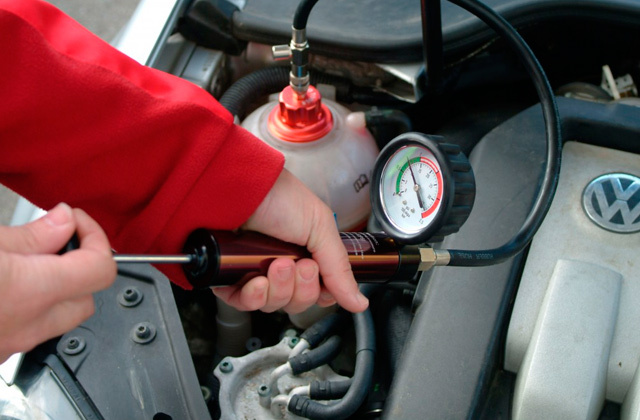 With it, you will be able to get underneath the car and perform the necessary repair work. 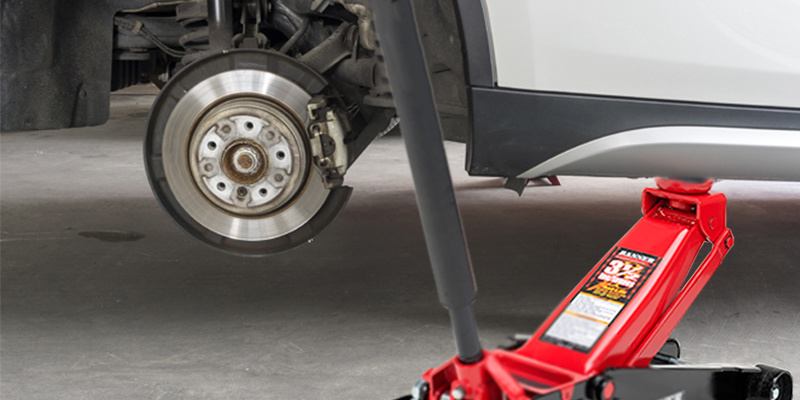 There are a lot of different types of car jacks out there but floor jacks are easily one of the most popular choices among car enthusiasts since they allow you to turn just about any area, no matter how small, into an actual workshop. Generally speaking, there isn't that much of a difference between these jacks, but there are a couple of things that you ought to pay attention to. First, you should always make sure that the lifting capacity of the jack matches the weight of the vehicle. Other than that, it never hurts to have a high lift range, especially if you're going to be working with different kinds of vehicles. 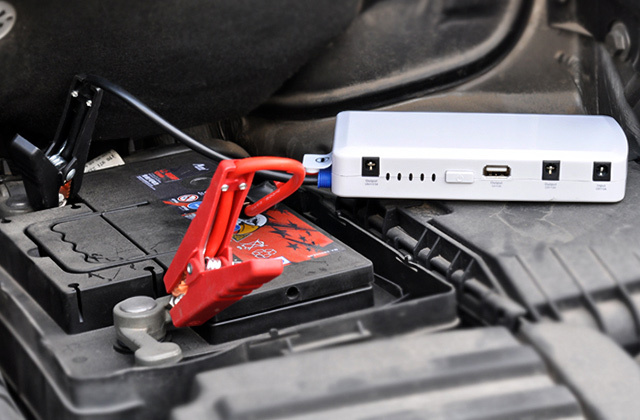 And if you would like to expand your arsenal of car maintenance tools, it wouldn't hurt to check out our reviews of car battery testers and jumper cables.